NAZARETH, Israel (CNS) — After sending hundreds of resumes to Israeli high-tech companies for over two months and getting no invites for interviews, computer science engineer Joseph Karkaby changed two things. The 34-year-old Catholic resident of the Israeli Arab village of Shfaram fibbed and changed his place of residence to the mixed Jewish-Arab city of Haifa and deleted the fact that he spoke Arabic. “Within three weeks I had three contracts to choose from,” said Karkaby, who now works as a software team leader at Galil Software, a joint Arab-Jewish-run company. With a name that could also be considered Jewish, the fact that Karkaby was Arab became apparent once he met the interviewers in person, but he needed the opportunity for the prospective employers to take note of his talent. Karkaby does not lay the blame on outright racism. People simply like to work with those who are similar to them, he said. Karkaby’s situation is hardly unique. 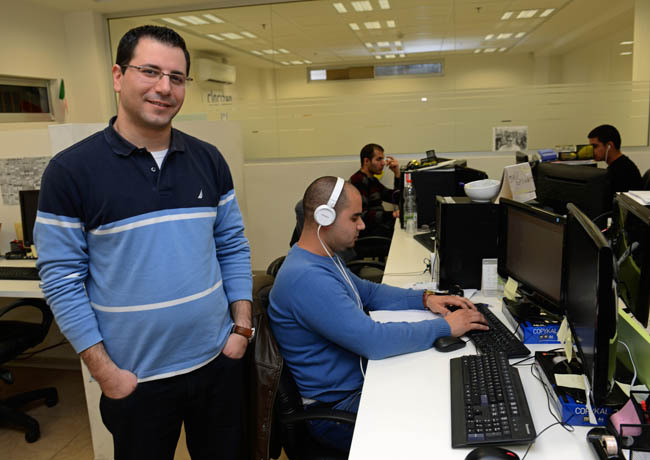 Hundreds of talented young Arabs with high-tech and business degrees struggle to find work in Israel, even as the country has been branded the Startup Nation with the high-tech industry leading the way, said Fadi Swidan, a Catholic who directs the Nazareth Business Incubator Center. Many Arab engineering and computer graduates in Israel end up being underemployed in jobs ranging from teaching to storekeepers. While Arab doctors, nurses and pharmacists are quite prevalent in the Israeli medical system, at the time Karkaby began his job search in 2009, there were only 350 Arab engineers holding high-tech jobs. By the end of 2014, the numbers had increased fourfold, according to Tsofen High Technology Centers in Nazareth, which works to integrate Arabs into Israel’s high-tech sector. Although Arabs make up 30 percent of Israel’s population, they account for only 1 percent of those working in high-tech jobs. Swidan identified two major hurdles facing most Arab entrepreneurs and high-tech professionals: living far from the high-tech hub in the center of the country and a lack of professional connections with Jewish Israeli counterparts because they are not subject to military service, where they can serve with elite technical units and be in contact high-tech recruiters searching for new candidates. The Nazareth Business Incubator Center, launched in 2014 with support from Israel’s Ministry of Industry, Trade and Labor and its Authority for the Economic Development of the Arab, Druze and Circassian Sectors, assists high-tech entrepreneurs to overcome such barriers with business consulting, training, networking, launch nights and links to mentors and financing channels to which they previously not had access. Much of the center’s work involves changing Arab perception of entrepreneurship and risk taking, Swidan explained. Imad and Reem Younis, a Catholic husband-and-wife duo, were the first Arabs in Israel to break into the high-tech scene by starting their own company in 1993. Reem said they founded Alpha-Omega in Nazareth precisely to combat those perceptions in their community. Today their team of 65 Jewish and Arab employees in offices in Nazareth, Germany and the United States provide neuroscience medical and research equipment to some 500 domestic and international customers. “We wanted to return to Nazareth to create a company that would employ Arabs,” said Reem Younis, explaining why the couple had left their positions in Haifa. She said neither she nor her husband encountered discrimination or difficulties other than learning how to run their own business. “People respect us, and we are very proud of our organization,” she said. With their headquarters in the new Tefen Industrial Park in Nazareth, the Younises see Alpha-Omega as a magnet for other high-tech companies to open offices in Israel’s largest Arab city. Reem Younis said she hopes their programs will serve as an incubator for young people to gain experience and branch out and perhaps open their own companies. He said that bringing high-tech opportunities into the Arab community has opened doors for Arab women, who traditionally tend to work near their homes. Today about 30 percent of high-tech workers in Nazareth are women, he said, and 100 percent of Tsofen’s female graduates are able to get jobs near their homes. At Galil Software, where Karkaby works, CEO Dror Gonen is one of two Jewish managers; the other seven are Arab. Gonen said enlarging the employment base in the high-tech industry is a “social good,” but the company is not out to be philanthropic in its hiring because it must remain competitive to stay successful. “We wanted to begin a business and started absorbing Arab talent. Today we service about 15 companies in Israel and employ 150 people,” Gonen said. Several of the employees are women who began their careers as teachers because they were unable to find jobs in their field after having studied technical subjects in college. Recruiters and headhunters are now making offers to the company’s employees, noted Karkaby, who said he also is getting other job offers when a few years ago he could not get his foot in the door anywhere.